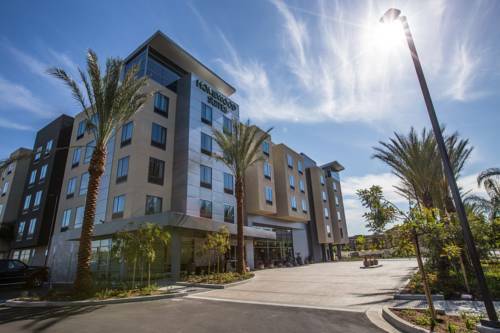 The Homewood Suites by Hilton Anaheim Resort Convention Center is within walking distance of Anaheim Convention Center Disneyland shopping and dining. Feel at home in a spacious studio or one-bedroom suite with complimentary internet access HDTVs and a sofa bed in the separate living area. All of our suites feature kitchens with full-sized refrigerators dishwashers microwaves twin-burner cooktops coffeemakers and utensils. Family suites have bunk beds for more sleeping space. Start each day with a hot full breakfast. After a long day at a conference or sightseeing enjoy evening dinner and drinks* Monday through Thursday. Both are included with your stay. Buy snacks chilled meals and essentials at the 24-hour Suite Shop or take advantage of our complimentary grocery delivery service. Visit the business center to check emails or print boarding passes. Organize a conference training session or wedding reception for up to 50 people in the 854 sq. ft. meeting space. Have fun in the outdoor heated pool on the waterslide or unwind in the hot tub. Stay entertained with the movie wall pop jets game room putting green and basketball sport court. A dedicated restroom is offered for your convenience. Relax and grill some burgers in the barbeque area. Work off some stress in the fitness center. *State and local laws apply. Reservations must be canceled by 48 hours prior to arrival to avoid penalty. Policy is subject to change.